It has been great working from these although I'm not sure my spinning has really done them justice. By the end of each one, I was finding that I'd made a bit of a mess of the last little bit which means that the singles are not as smooth or fine as they could be at the transition points. You live and learn, and this is something I'll be more mindful of next time. And now for the big question - if you put a spinning wheel on your Christmas wishlist, which would you ask for and why? And if you were a beginner, would you give the same answer? I love spindling so much I think it might be fun to learn to use a wheel too. Before asking Santa to invest, I plan to visit the local Guild, but would be really interested to hear what you all think. As usual, there is a link below so you can add your own spinning/fibre posts. If you can't see it on your device please open this page in your web browser. I'll be back tomorrow with WIPs and books, see you then! Your handspun is looking so fun! I have only spun on a wheel once, in a class at my LYS. After trying a few wheels there I think that I would ask for a Schacht Ladybug Spinning Wheel. I am interested to see what you decide. I absolutely love my Ashford Traditional but I would probably ask for an Ashford Joy because they are a bit more portable and less space-wasting, which in a London flat is really important! That Craftsy class gave me total wheel jealousy, too. I wanted that one so badly! 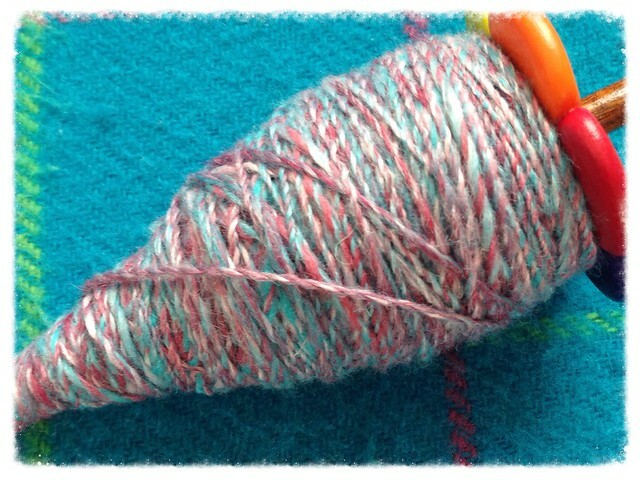 It looks like barber pole twine but way softer. You go on wishing for a spinning wheel. I'll be putting a private drop spindle lesson at the LYS on mine.